Based on reviews from 37 experts and 2,176 users. 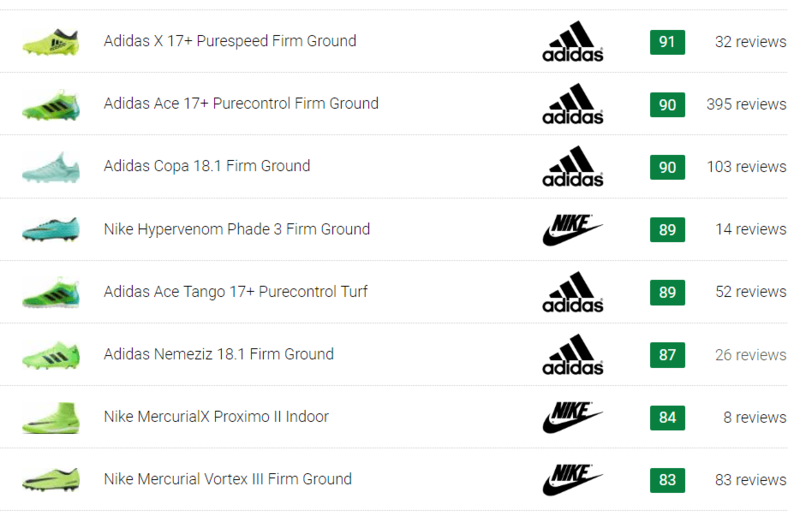 Learn how our rankings work or see our guide to green football boots. Updated Apr 2019. While boot specs matter, it’s undeniable that a football boot’s overall look matters just as much. One’s football boot is most often a reflection its wearer’s personality. Due to this fact, it is unsurprising to see why brands create new boot collections almost every season, each more striking than the last. A sea of color graces the field from red soccer cleats, blue football boots to the more flashy neon colorways. 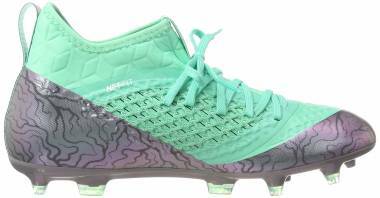 Coming from one of the more vibrant colorways are green football boots. While green is described as the color of life, energy and wealth, some find it as a representation of envy, greed, and ambition. With conflicting meanings, maybe this is the reason why green football boots are dubbed to be for enigmatic players. The player whose play is outstanding one day and M.I.A. the next. Someone who’s hot and cold and an artist at work. Either way, green football boots are sure to make each player stand out on the pitch. As history would have it, there has not been a shortage of black football boots. It was fairly recently that the use of vivid colors in football boots rose in popularity. The first to break away from the mold was Hummel when they released their first white football boots. The popularity of their release was aided by the fact the Alan Ball sported a pair of Adidas boots that was painted white to look like Hummel cleats. Since then, colored boots slowly rose into prominence with players like Charlie George opting for red football boots and Alan Hinton going for white soccer cleats. While the fashion-forward Hummel jump-started the color trend, there still was an aversion to wearing vibrant cleats in the past. And just like a prize to be won, you had to earn your right to wear eye-catching cleats by being one of, if not the best on the pitch. Color was slowly introduced into football boots through small applications - splashes of color used in the shoe’s details as well as the soleplate. The 90s took a huge leap with neon and brands like Lotto and Diadora using blue and green detailing. But the biggest push for colored cleats might have been the release of the 1998 Nike Mercurial featuring a silver/ blue/ yellow colorway with the football legend Cristiano Ronaldo. Since then, tables have completely turned with more vibrant cleats strutting the pitch. Green football boots are one of the more common colors found in the field today. Players like Yaya Toure, Sergio Aguero, and Matthew Etherington all had their hand in wearing green football boots. Over the years several football brands have come up with their version of green football boots. Developing striking colorways and combining different shades of green with other colors have produced spectacular, if not unique-looking cleats. 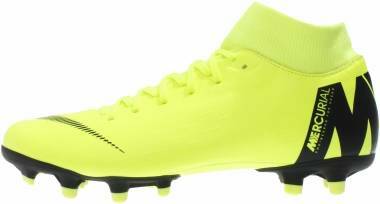 Here are some notable selections of green football boots that not only bring their A-game in the looks department but is also excellent when it comes to performance. This visually striking pair has been one of the first ever laceless football boots. It sports a Solar Green/ Shock Pink/ Core Black colorway. While the green football boot wears Solar Green from the upper to the soleplate, it received doses of Shock Pink on the studs and the pull tab. The Adidas logo is also presented in three black stripes on top of the upper. Released in 2006, the Puma v1.06 football boots sported the Unseen Green colorway. It features white stripes running vertically down from the collar to the lower lateral side of the green upper. Signed by none other than the legendary footballer, Pele, there’s a good reason why this green football boot is considered as one of the greats. It was hailed as one the good lightweight options during its time. Puma made a re-release of this green football boot in 2016. Released as a special edition boot, Nike released this green football boot with the soccer superstar, Cristiano Ronaldo. It features an Electric Green/ Black/ Hyper Punch colorway. The cleat consists of an Electric Green base color in the upper to the soleplate with the Hyper Punch Nike logo outlined in black. 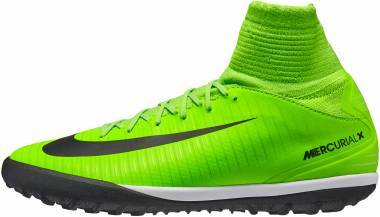 This green football boot features a Flyknit upper with a Dynamic Fit collar on top of a full-length carbon plate. Worn by the celebrated Brazilian soccer player, Neymar Jr., the Nike Hypervenom Phantom 2 in the Lightning Storm pack was designed for attackers on the pitch. This green football boot has the Green Strike upper with the Swoosh logo outlined in black. The soleplate also boasts a black patterned design which makes for a more stand-out model. 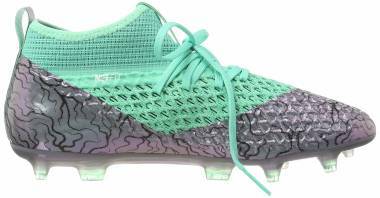 Mario Götze, Iniesta, and Thiago Silva are some of the players that laced-up to wear this eye-catching green football boot. 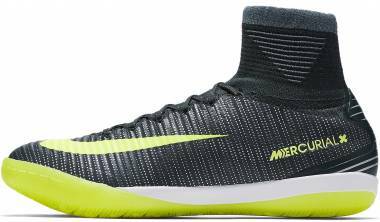 Featuring a Poison Green/ Flash Lime/ Total Orange/ Black colorway, the Nike Magista Obra has a one-piece design with a tongueless upper which is meant to create a better ball touch. The soleplate has not been exempt from the main colorway with studs still sporting orange and black on a mostly green soleplate. 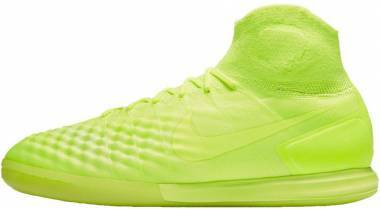 This colorway has also been featured on the brand’s Magista Opus model. Released in 2013, this cleat is available in several colorways. Perhaps the most eye-catching of the collection is the Black/ Ray Green colorway. An interesting-looking green football boot, to say the least, the upper is peppered with rubber Xs which creates texture and provides a better ball control. Several shades of green have been used for the whole boot with the upper sporting the darkest shade. Adidas’ logo is in black as well as the studs found on the back portion of the boot. Aptly named, this explosive pair sports an Electric Green/ Ghost Green/ White/ Black colorway. The majority of the shoe sports green with the exception of the Nike logo which is in black and spread across the Flyknit upper. 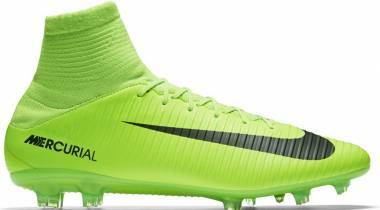 The word Mercurial is also printed on the side of this green football boot. Worn by Olivier Giroud, Yaya Touré, and Gianluigi Buffon, the Puma Evopower Vigor 1 was highly popular in 2014. Released in the Green Gecko/ Puma Black colorway, it features a vibrant green AdapLite upper with the Puma logo in black. The central lacing system and the laces sported a lighter version of the Gecko Green. The Pebax outsole and studs also sported a combination of black and green. An updated version of this green football boot has been released in 2017. The last AdiZero release, the F50 has sported a Solar Green/ Black colorway. The spring-inspired design brings a ghost pattern element that creates a phantom cloud effect in the upper. A Hybridtouch and a 3D DribbleTex print have been used in the construction of the boot. 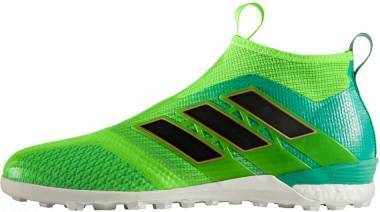 This green football boot has been part of the Adidas Haters pack. 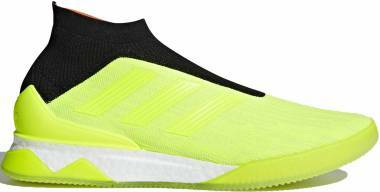 As part of the Turbocharge collection, the Adidas Ace 17+ Purecontrol sported a Solar Green/ Core Green/ Core Black/ Gold colorway. Sporting several shades of green, the upper consists of a Primeknit upper with a mid-cut collar creating a snug fitting boot. The Adidas logo appears in black with a Solar Green outline. Paul Pogba and Mesut Ozil are the key players who sported this green football boots. In 2017, the Adidas EQT (Adidas Equipment line) Green pack is a limited collection which includes a trio of well-known boot models including the Adidas Ace Tango 17+ Purecontrol, Adidas Mundial Team and the Adidas Copa 17.1. All three models sport a Green/ Black colorway and boast of bringing the stadium experience to the streets. Nike Hypervenom 3 DF Tech Craft "Black/Electric Green"
The last boot released for the Tech Craft collection, the Nike Hypervenom 3 DF features a Dark Green and Black colorway. 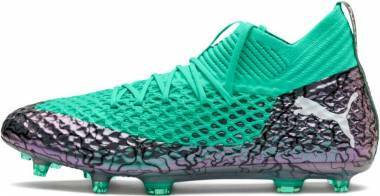 The brand opted to make this model a green football boot compared to the Mercurial, Magista and the Tiempos which sported a black and silver design. An updated version of the old Evopower model, this pair sports a striking Gecko Green and Black colorway. The updates include a one-piece construction with a Spandex-sock design - a first for an Evopower cleat. Accufoam is also used in the creation of the mostly green upper. PWR (which stands for power) is printed in bold black letters on the side of the green football boot and the Puma logo on the opposite side. 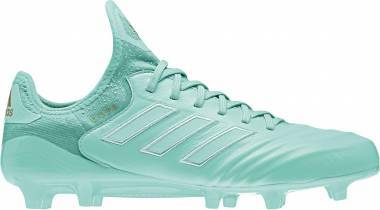 How are colored cleats different from black soccer cleats? In the old days, wearing colorful cleats would typically raise some eyebrows; the complete opposite is true today. While people are not necessarily antagonistic to black football boots, it comes as a surprise whenever a brand decides to release an all-black colorway. Wearing colorful cleats can help players stand out on the pitch. This is especially useful for new players who are just starting out and eager to show their skills as well as their personality on the soccer field. How do I take care of my green football boot? 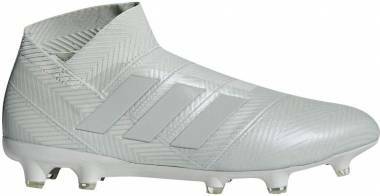 Regardless of what color your boot has, it is essential to take care of one’s football boot to ensure optimal performance. Here are some basic tips for taking care of your green football boot. Unlace your boots before taking them off. Avoid yanking or kicking off your shoes. Use a damp cloth and soap when cleaning your boots. Avoid using a wire brush and cleaning agent as these can be too harsh and can damage the boot. In drying your soccer cleats, you can stuff the shoe with newspaper; this can help in retaining the boot’s shape. Who are the players that are popular for wearing green football boots? Nike Hypervenom Phantom II - Neymar Jr.